From the creator of the famous Dumpling Inn on Convoy Street, Del Mar Rendezvous has been enticing San Diegans with its wide array of Chinese fare complimented by a modern mix of Asian flavors for over a decade. Rendezvous boasts craft, local, and high-end import beer on draft, Japanese sakes, as well as a Wine Spectator Award of Excellence wine list with over 100 wines all at the Best Price in San Diego everyday. With over 100 different dishes on its menu, Rendezvous also caters to both gluten-free and vegetarian guests with over 40 dedicated options to choose from on each menu. The ambiance of the interior and patio, with glimpses of the Pacific Ocean, offer a calming and inviting atmosphere, perfect for date nights, business lunches or family dinners. Del Mar Rendezvous represents the fourth of five San Diego restaurants opened by former Executive Chef Mark “Mau” Sun in his forty-year restaurant career. 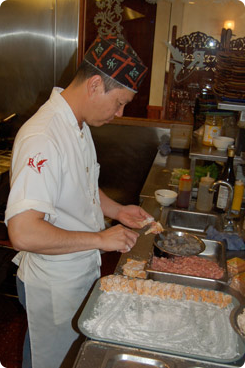 Mark’s family has been in the restaurant industry for three generations, with his ancestors cooking for the Chinese emperors in the 19th century. Mark opened Del Mar Rendezvous one year after his first failed attempt at retirement. Fortunately for our guests, the idea spawned from Mark’s frustration with current Asian food trends and a lack of quality alternatives in the higher-end Chinese arena. Mark’s concept behind the restaurant was to take old world Chinese and Asian recipes and modernize them using his creativity, attention to presentation, and use of the freshest and highest quality ingredients available. As someone who has been exposed to and has appreciation for the many different cooking styles of the world, Mark enjoys incorporating ideas from other cuisines and cultures into his dishes.